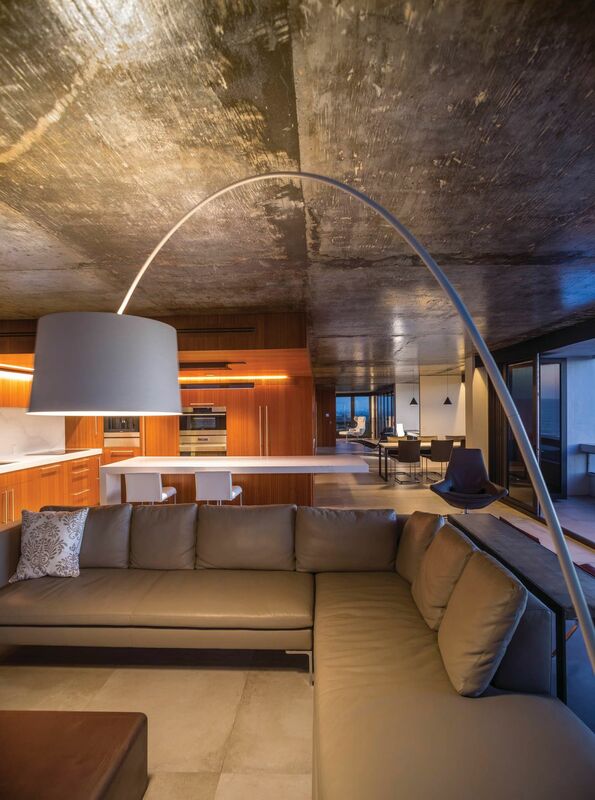 The architects removed interior walls that had separated the condos to create one sleek, flowing living space. 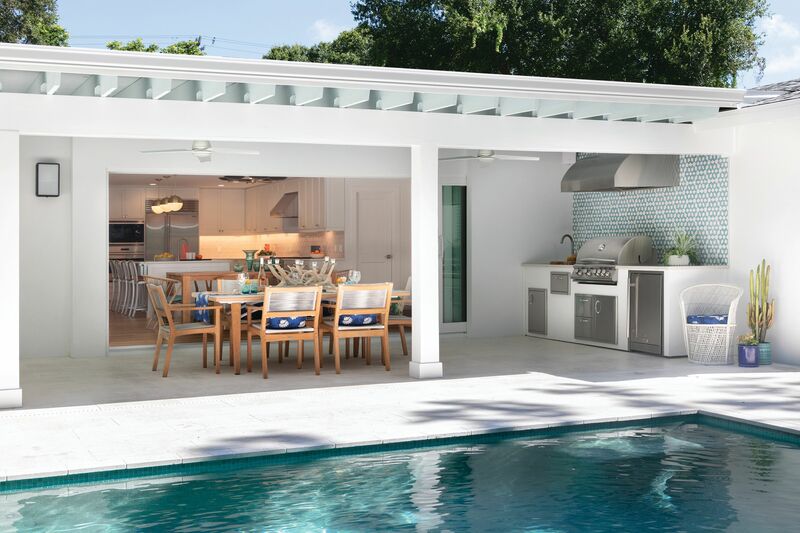 One look at this transformation of two dated Siesta Key condominium units into one distinctly 21st-century vacation home and you may not be surprised to learn that the owner manufactures precision instruments. 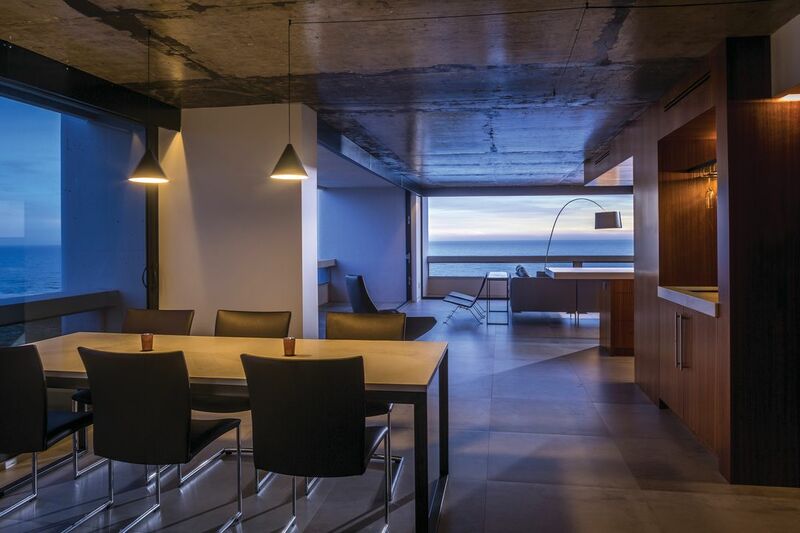 Sleek and spare, with an abundance of wood, steel and concrete, the project is the result of combining two corner units on the 15th floor of The Terrace, the iconic condominium tower that hovers over a broad stretch of beachfront at the western end of Siesta Village. 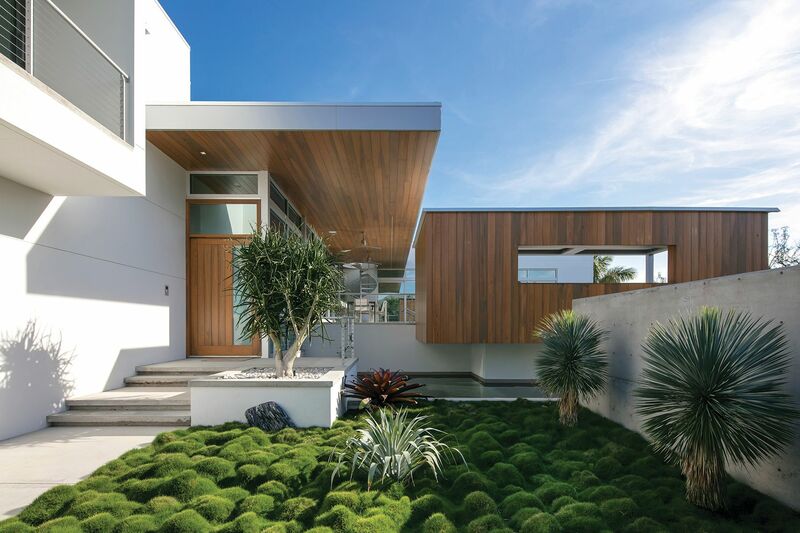 Earlier this summer, it earned for Halflants + Pichette Studio for Modern Architecture an Honor Award of Excellence in Interior Design from the AIA Florida/Caribbean chapter, one of only two projects in the state to do so. 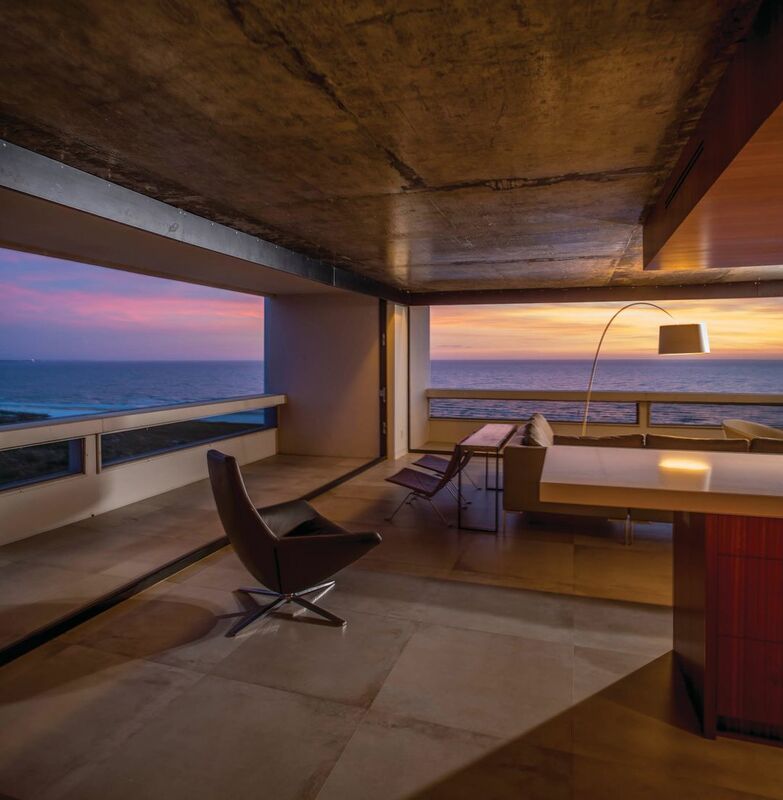 The Sarasota architecture firm designed, built and furnished the combined condominium for a couple who vacation here often from Chicago, where he is a senior executive with a global precision instrument manufacturing company. 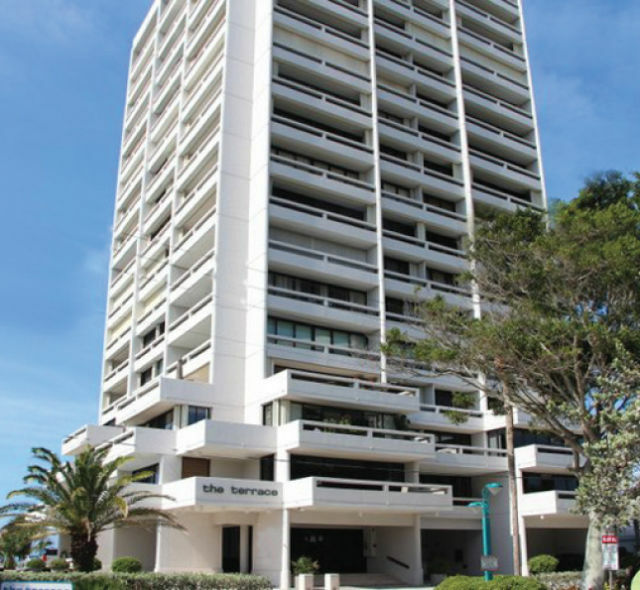 Siesta Key's iconic Terrace building. We can’t disagree. Architect Michael Halflants removed all the interior walls to combine the units into one flowing 2,365-square-foot space, then created a central core housing a kitchen, storage area, enormous walk-in closet and master bath—all clad in a handsome reddish-brown African wood called Etimoe. 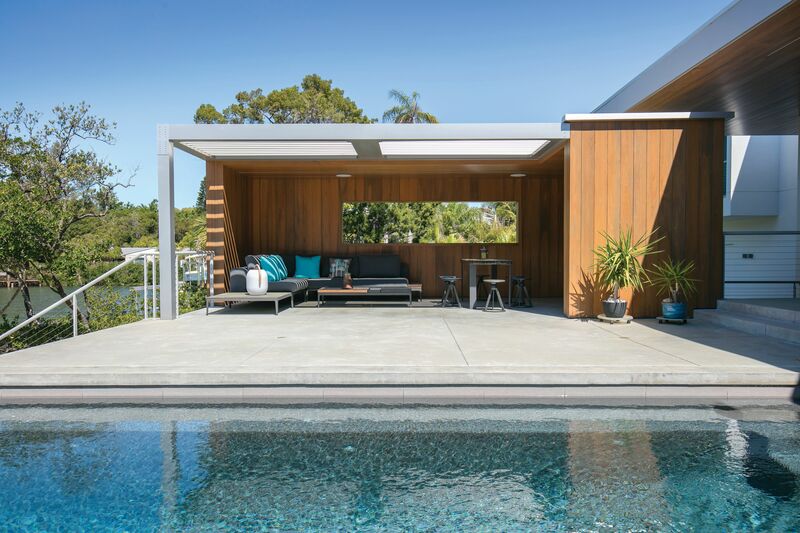 To separate the master suite from the living room, kitchen and second bedroom, he devised 10-foot-wide, floor-to-ceiling folding partitions—Etimoe wood on one side, steel on the other. Now the owners can have their privacy when family visits, or when one wants to watch TV or work at the custom steel desk Halflants designed while the other reads in bed. One key element, “the main design challenge,” says Halflants, was the height of the ceilings, or rather the lack of height; after all, seven-foot ceilings were ubiquitous in homes of the 1960s and ’70s. When he scraped back the original popcorn ceiling to expose the original concrete, then added a clear-coat finish for a reflective sheen, he and the owners agreed that it became a design asset that contrasts nicely with the warm wood, rather than a liability. To further the feeling of uninterrupted space, the architects chose 30-by-30-inch gray porcelain tiles throughout that mimic concrete, and contemporary furniture in neutral tones, including a lounge chair by Poul Kjaerholm, a B&B Italia couch by Antonio Citterio and a swivel chair by Jeffrey Bernett. 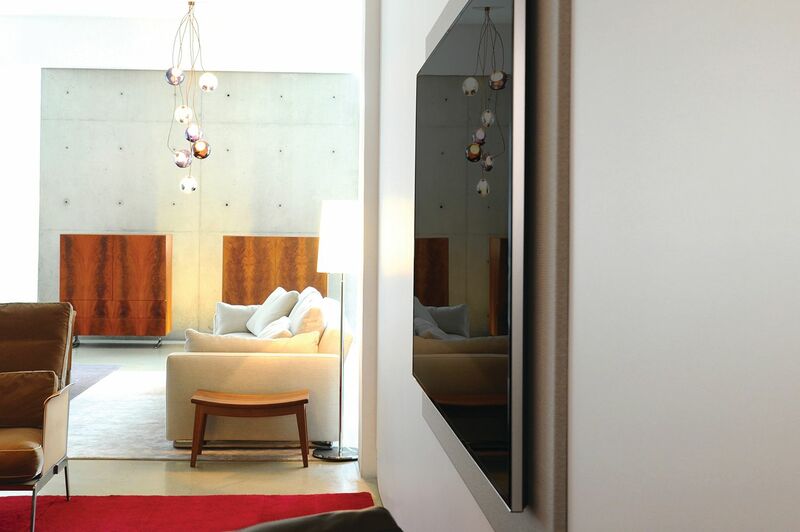 The latest high-tech home products.